Shaping lives: Majella Ritchie (left) with Aboriginal twins Pheonix and Havana Withers, Prep students at St Flannan’s primary school, Zillmere. MAJELLA Ritchie knew nothing about Australian indigenous culture when she left university two years ago, but in two months she’ll be responsible for a handful of Queensland’s Aboriginal and Torres Strait Islander children. The teacher at St Flannan’s primary school, Zillmere, is headed to Innisfail in January to greet 90 indigenous children at Radiant Life College, a Christian school giving indigenous Australians a positive education. “There’s something really unique about indigenous children,” Miss Ritchie said. 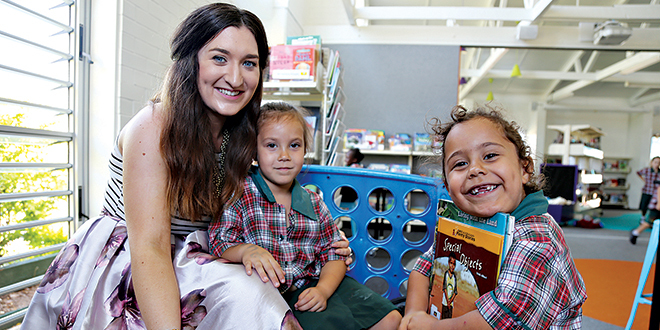 Miss Ritchie’s debut to teaching last year also marked her introduction to indigenous culture, coming in the form of children in Years 4 and 5 from St Mary of the Cross Parish School, Windsor, a school catering to a predominantly indigenous cohort. “They invited me into their culture, their elders all welcomed me and they taught me so much about their lives,” she said. But inside the classroom Miss Ritchie also saw a more troubling side to indigenous life. “They have very difficult lives,” she said. “We would come to school on Mondays and they would have so many stories to tell you but they were so open to teaching you about their lives and with their grandparents, who are part of the stolen generation. Miss Ritchie said she was also concerned about family attitudes towards education, which often led to no-shows in the classroom. “I guess what was upsetting for me is they didn’t have a positive attitude towards education and neither did their parents or their grandparents,” she said. Miss Ritchie’s first year with indigenous students became a success, with attendance rates increasing by the end of the school year. Her passion for indigenous students continued at her next teaching appointment. While she’ll miss the adorable hugs from her students, Miss Ritchie hoped her new adventure in north Queensland would propel her into a career that helped young indigenous students to excel. “I wanted to be a teacher since I was six,” she said. “I wanted to be a teacher that made children love learning as much as I did so seeing these children not love school, I saw it as a challenge but an exciting challenge. “I want them to be able to see that they are successful because they have so much to offer and they are the most talented children you’ll ever meet. “I just want them to see themselves and believe in themselves. “I think as teachers we can do that.